On Saturday and Sunday July 11-12th His Eminence Mor Cyril Aphrem Karim went on a spiritual pilgrimage to the holy places of Tur-Abdin. After Crossing the border from Kamishly, he drove to the famous Monastery of Mor Augin (St. Eugene) which occupies a prominent place on the slopes of Tur (Mount) Izlo. This monastery was established in the fourth century. It played significant role in the history of our church, especially during the Nestorian controversy. It continued to function as the principal spiritual center in the area until the early seventies of the last century. It was closed by the Turkish Army to prevent terrorists from taking refuge in its buildings. However, last year the Turkish authorities paved a new road leading to the entrance of the monastery which provides an easy access to the monastery. 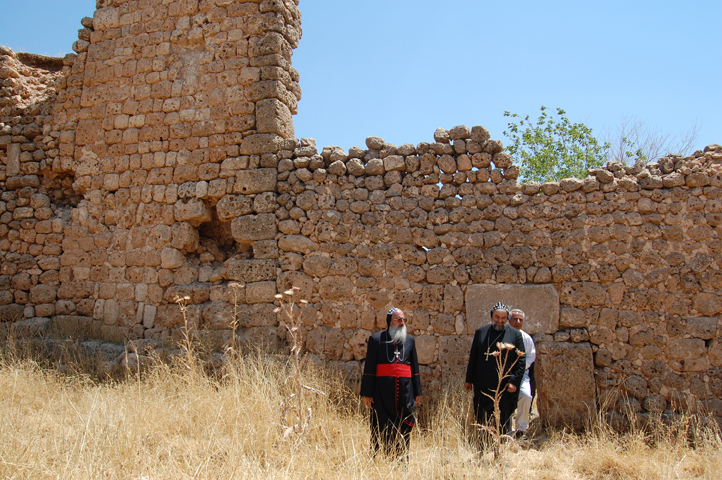 Following the visit to Mor Augin Monastery, On Saturday, July 11th His Eminence continued his pilgrimage towards Mor Gabriel Monastery in Tur-Abdin. He arrived at the Monastery during the evening prayer service. At the end of the prayer service he joined the residents and guests of the Monastery in their traditional procession in the chamber of the tombs of the Saints (Beth Qadeeshe) which is conducted every Saturday. On Sunday Morning he participated in the Holy Qurbono celebrated by one of the clergy of the Monastery. 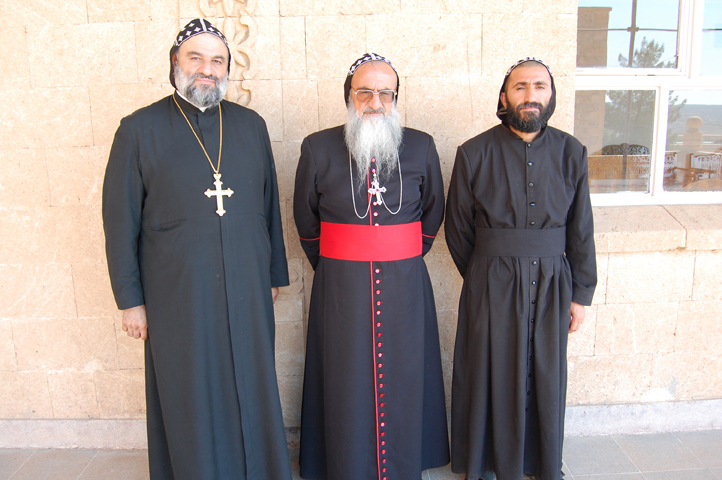 After Holy Liturgy the Archbishop of Tur-Abdin H.E. Mor Timotheos Samuel Aktas took his guest to the village of Hebob, which used to be one of famous and largest towns in the area. It was home to Mor Cyril Aphrem Karim’s great grand fathers. In Hebob they were met by Mr. Mousa who invited them to his newly built house for refreshments. They visited the Monastery of Mor Eliyo (Elijah) outside the village and the church of the Virgin Mary and Sts. Bergius and Bacchus. This church is one of the largest and oldest churches of Tur-Abdin. It served as a diocesan center for many decades. They then visited the village of Kafro, which is known for its beautiful new houses recently built by its former residents who moved to Germany and other parts of Europe. They were hosted for lunch by some residents who were in the village on that Sunday. 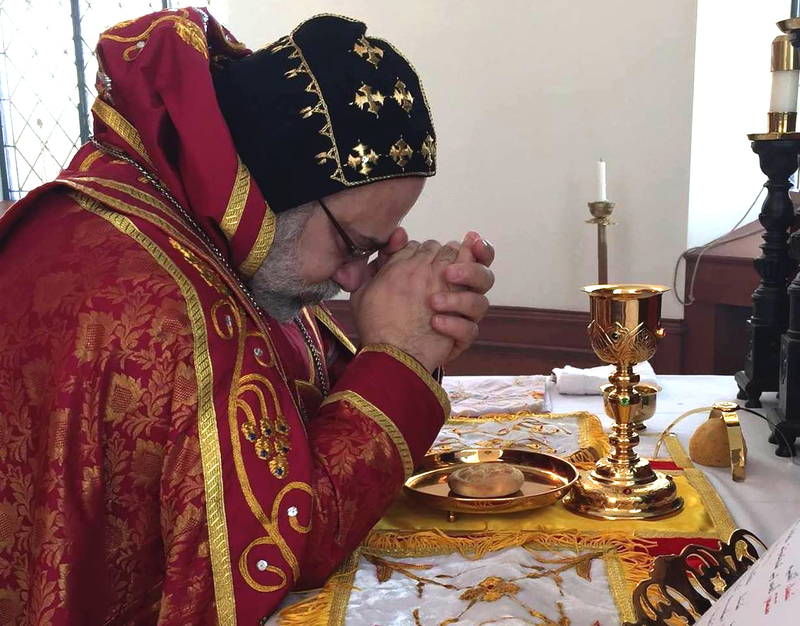 Following lunch, His Eminence was taken to Nusibin by Mor Timotheos to cross the border to Syria concluding a 24 hours most uplifting spiritual journey in the land of the ancestors.